The Yasawa Flyer - island hopping to your Fiji resort! Need to get to your exotic island resort in Fiji? 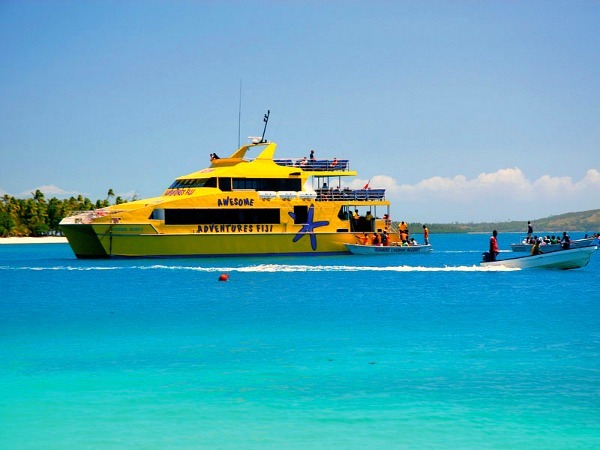 The Yasawa Flyer takes you on a stunning island hopping trip to your resort in the Mamanucas and Yasawas! The Fiji island hopping adventure at your service! The Yasawa Flyer, otherwise known as 'The Yellow Boat' or 'The Flyer', is a comfortable high-speed catamaran that island hops dropping off and picking up sun-kissed tourists for the Yasawa Islands. It passes through 3 islands in the Mamanuca Islands (South Sea Island, Beachcomber Island, and Vomo Island) on it's way through to the Yasawas. For those going to other islands in the Mamanucas, South Sea Cruises is your option here. * Accurate from November 2013. Times and locations are subject to change anytime. The 'Bula Pass' is your transfer option for your pre-booked white-sand beach resort(s) in the Yasawa Islands and selected Mamanuca Islands. Choose the length of your pass (starting at 5 days and up to 21 days). Your Bula Pass is valid for travel on board Awesome Adventures’ Yasawa Flyer for transfers between Denarau Marina, South Sea Island, Beachcomber, Mana and Malolo Island (Mamanuca Islands), in addition to all the Yasawa Island destinations on the Yasawa Flyer route. All changes between Awesome Adventures’ vessels and South Sea Cruises’ vessels must be done in the Islands. The Flyer hops between resorts and islands for the consecutive number of days designated. Your Bula Pass is activated on the first day of travel and remains valid until the last day inclusively. It’s important to note that although your transfers are paid for, reservations must still be made for all transfers at least 24 hours prior to departure and accommodation MUST be booked before disembarking the Yasawa Flyer. You will not be allowed to disembark the Yasawa Flyer unless you have pre-booked accommodation on the island. This requirement is because resorts are often fully booking so walk-ins will not always work. All accommodation bookings can be made at the Travel Desk on board Yasawa Flyer or contact Awesome Adventures reservations. * Rates are in Australian dollars (AU). Fares are subject to change anytime. 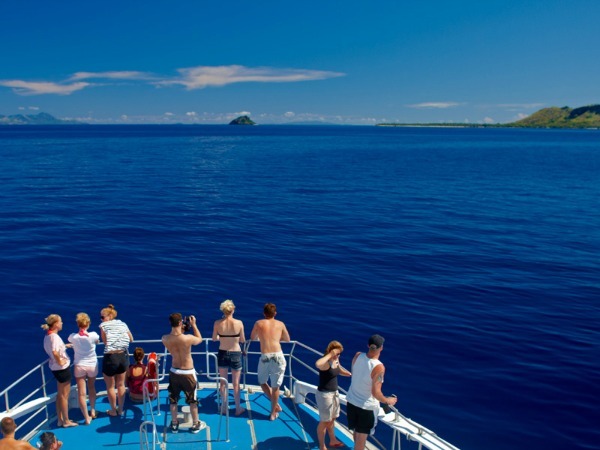 Visit the company's booking page Awesome Adventure Fiji - Bula Pass here. The route of the 'The Flyer' to the Yasawa Islands via the Mamanuca Islands. The Yasawa Flyer is operated by Awesome Adventure Fiji and has been servicing the Yasawa Islands for 15 years. They also offer a very flexible transfer + accommodation (Bula Combo Pass) service, incorporating almost 20 islands and over 30 resorts! That means you can hop on and off islands as you please!